Situational awareness: Midterm voting begins! Election Day is Nov. 6, 46 days from now. But AP reports that in-person voting begins today in Minnesota, "making it the first battleground state to begin casting actual votes in the ... fight for control of Congress." The Republican Party is suffering an identity crisis that poses acute short- and long-term risks: President Trump, with 38% approval in Gallup, is giving the party a constricted appeal, with the danger of continuing high-profile defections. The GOP, long synonymous with conservatism, is now effectively the Trump Party — in policy, branding and support. That leaves some swaths of traditional conservatives without a major-party home, and endangers Republican electoral fortunes. And two of the party's mega-donors renounced the GOP last week: hedge fund manager Seth Klarman, once Republicans' biggest donor in New England, and Les Wexner — the wealthiest GOP donor in Ohio, and founder, chairman and CEO of L Brands, which includes Victoria's Secret. Why it matters: In a 50-50 nation, marginal defections can incapacitate a party, Axios CEO Jim VandeHei points out. For now, this is a crisis of the intellectual and power elite: "Morning" Joe Scarborough; his frequent guest Steve Schmidt; N.Y. Times columnist Bret Stephens; WashPost columnists George Will, Michael Gerson, and Max Boot. The danger for Republicans is that they get clobbered in November, and a trickle becomes a steady stream. Sen. Ben Sasse of Nebraska, 46, a rising star in the party, continues to flirt with leaving the party — a small sign of a talent crisis that could lie ahead for the GOP. Sasse recently fired off a quartet of tweets praising a devastating critique of the right's current straits: "America Desperately Needs a Healthy Conservatism," by Andrew Sullivan of New York Magazine. "In today’s America, [traditional] conservatism is completely under siege," Sullivan writes. Trump "assaults the norms that conservatives revere, has contempt for existing institutions and sees the rule of law as a means to advance his own interests, rather than that of the society as a whole." Gallup's most recent gauge of party identity has 28% of Americans considering themselves Republicans, 27% calling themselves Democrats and 43% identifying as independents. It's that big middle group where you see the looming threat to the vitality of the GOP: Some Trump policies are so polarizing that independents are likely to be increasingly inaccessible to the Republican Party, giving Democrats a potentially overwhelming advantage in the pool of voters they can activate. A former White House official told me: "Shifting demographics have been a problem for Republicans for a long time. Paradoxically, while Trump likely exacerbated that problem in the long term, he also postponed its consequences because he carved out a new path to 270, in large part thanks to his trade rhetoric." "The problem post-Trump is that what he did is not replicable." Be smart: High profile defections like the ones above won't change the electoral math of the heartland, where GOP presidencies are won. The danger is Trump's alienation of quiet conservatives: They won't make big announcements. They just won't show up. And they could form the base for a new conservative party — run by someone like Sasse. A source who has been talking to President Trump throughout the Kavanaugh crisis told Jonathan Swan that “you have no idea” how hard it has been to keep him from attacking his Supreme Court nominee's accuser. At a rally in Las Vegas last night, Trump praised Kavanaugh and added with rare restraint: "I'm not saying anything about anybody else. ... So we gotta let it play out. ... I think is everything is going to be just fine." Be smart: Kavanaugh's Republican strategists are holding it together, but are still nervous about the unknowns — and nervous about additional stories. There’s a constant rumor mill that X publication has more female accusers. (Yesterday's rumor circulating Trumpworld was that it was the WaPo. Over the weekend, the rumor was Ronan Farrow.) Just very feverish. Testimony in limbo: Lawyers for Kavanaugh's accuser, Christine Blasey Ford, told the Senate Judiciary Committee that it's “not possible” to appear Monday ("and the Committee's insistence that it occur then is arbitrary in any event"), but that she could testify later in the week, CNN reports. "Ford's lawyer made clear that at no point ... could Ford be in the same room as Kavanaugh." "There was also a request that Kavanaugh testify first at the hearing — which a ... source said ... committee Republicans were unlikely to grant." Around a century ago, amid a massive surge of immigrants, Americans — themselves virtually all of foreign blood — pushed back in what turned into a more than four-decade-long uprising against newcomers, Axios future editor Steve LeVine writes. Now, the U.S. immigrant population is nearing the same proportions, and again Americans are revolting. At 13.5% last year, the population of foreign-born U.S. residents is nearing the peak of 14.8%, reached in 1890. And, if so, it won't be easy to tamp down: The last time, it took the legislative mastery of Lyndon Johnson to quell the hysteria, in a bill he muscled through Congress in 1965. But now there is no Johnson. "Investors are craving marijuana stocks as Canada prepares to legalize pot next month, leading to giant gains for Canada-based companies listed on U.S. exchanges." "Billions of dollars have poured into the stocks in the last few months." P.S. Dow and S&P 500 closed at records yesterday, beating all-time highs set in January. 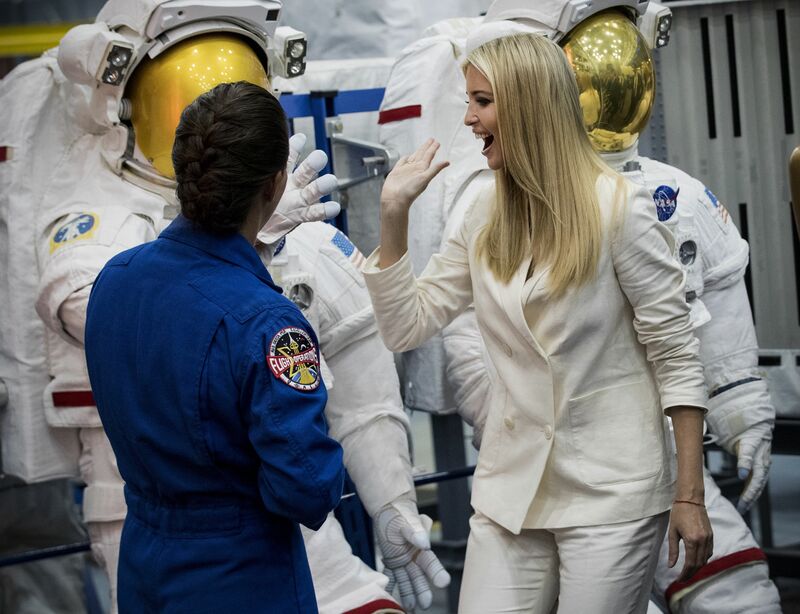 Ivanka Trump high-fives a space suit yesterday during a tour of the Space Vehicle Mockup Facility at NASA's Johnson Space Center in Houston. "Days after the Trump administration instituted a controversial travel ban in January 2017, Google employees discussed [in internal emails] ways they might be able to tweak the company’s search-related functions to show users how to contribute to pro-immigration organizations," The Wall Street Journal's John D. McKinnon and Douglas MacMillan report (subscription). Why it matters: "The disclosure is certain to fuel complaints by many Republicans that Google ... stifles conservative viewpoints." Google replied: "These emails were just a brainstorm of ideas, none of which were ever implemented ... Google has never manipulated its search results or modified any of its products to promote a particular political ideology." "Eric Schmidt, who has been the CEO of Google and executive chairman of its parent company, Alphabet, predicts that within the next decade there will be two distinct internets: one led by the U.S. and the other by China," CNBC's Lora Kolodny reports. 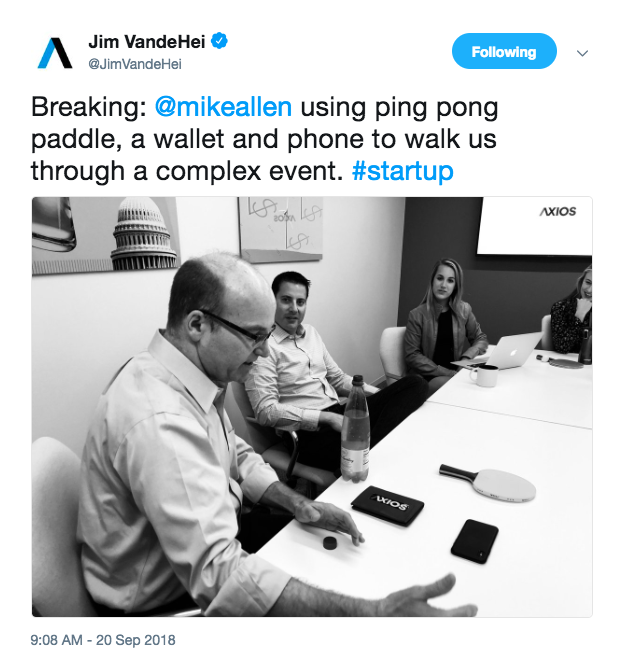 "Schmidt shared his thoughts at a private event in San Francisco on Wednesday night convened by investment firm Village Global VC." "I think you're going to see fantastic leadership in products and services from China. There's a real danger that along with those products and services comes a different leadership regime from government, with censorship, controls, etc. "Look at the way BRI works — their Belt and Road Initiative, which involves 60ish countries — it's perfectly possible those countries will begin to take on the infrastructure that China has, with some loss of freedom." Today, we'll hit "go" on the launch edition of our weekly Axios Autonomous Vehicles newsletter, which will be written by Joann Muller, former Detroit bureau chief for Forbes. Announcing the move, Talking Biz News called her "auto industry reporting titan Joann Muller." Get the first issue: Sign up here to join the conversation about this accelerating revolution. "Humans are still a lot smarter than even the smartest cars — and are still babysitting them every step of the way." "Smarter algorithms will help self-driving cars avoid lapses in judgment. 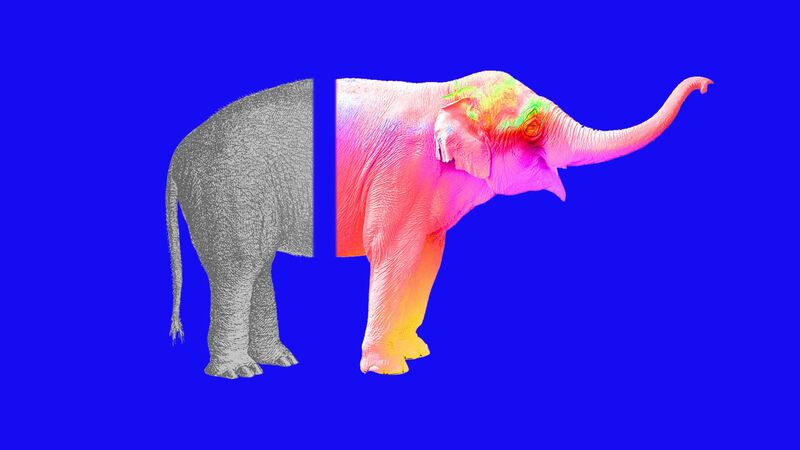 Deep learning can be 'brittle,' getting confused by a situation slightly different than what it’s used to, like a stop sign with stickers on it." "So some are experimenting with combining rule-based learning with pattern-matching deep learning." Axios Video: Five ways 5G could change your commute. 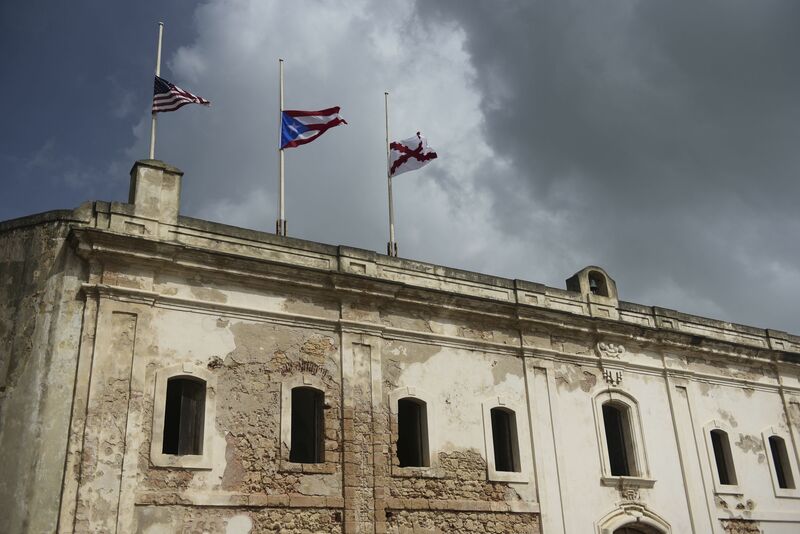 The New York Times visited more than 150 homes in Punta Santiago, a small town in southeast Puerto Rico near where Hurricane Maria made landfall a year ago this week, to document the damage that remains. Airbnb has sent a letter to the SEC asking to be allowed to give equity to its hosts, Axios' Kia Kokalitcheva reports. Airbnb's letter addresses the SEC's interest in potentially revising Rule 701 of the Securities Act to add a "gig economy worker" category. Currently, private companies like Airbnb can only give equity to investors and employees.